Amid the explosive growth in data volume, variety, and velocity, organizations must identify and overcome barriers to leveraging the hidden value of big data. Moreover, organizations are finding that as sensitive data is added to the mix, there are new issues regarding data security, privacy and compliance. According to the survey report, “Governance Moves Big Data from Hype to Confidence,” organizations are significantly more confident in structured data generated internally versus other forms of data. However, despite this lack of trust in big data sources, confidence in big data reports is contradictorily high. And in another unexpected finding, while analysts might be expected to spend the majority of their time scrutinizing data, business and IT people who are engaged in analytics say they actually spend over half their time finding and defending data instead. Analysis in fact accounts for little more than a quarter of the time spent on analytics-related tasks. The survey found that the percentage of organizations with big data projects in production is expected to triple in the next 18 months. However, as the data volume and number of data sources continues to soar, companies’ faith in their data is going to be an ongoing challenge. Check out this infographic on the survey results. 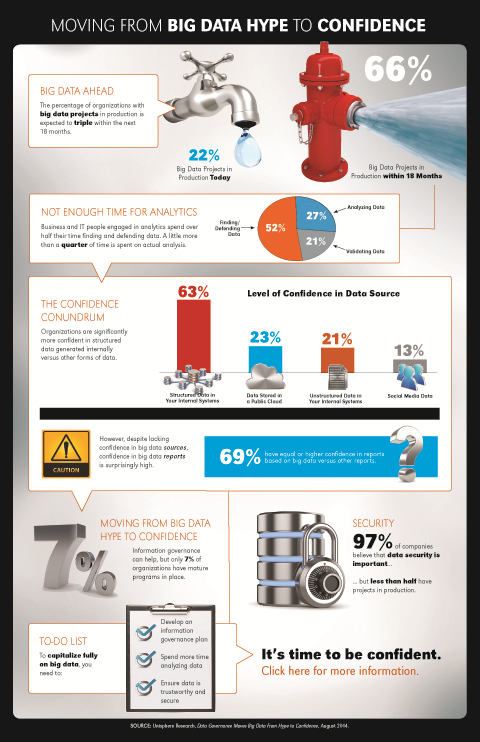 Source: Unisphere Research, Data Governance Moves Big Data From Hype to Confidence, August 2014.